Accessories: Accompanied by Rolex original hang tag, and presentation box. An artwork representing this timepiece as found on the back cover of this catalogue will be offered to the winning bidder. Reference 8171 is lovingly dubbed "Padellone", which translates to "large frying pan" in Italian. Boasting a generous 38 mm case, it is slightly larger than its waterproof Oyster sibling, reference 6062. Both references 8171 and 6062 were the only two vintage Rolex models with moonphases, giving them a mythical reputation and cult-like following. Produced for a very short period of time in the early 1950s, reference 8171 and 6062 were available in yellow gold, pink gold, and stainless steel. Quite likely one of the greatest and best preserved yellow gold reference 8171s to surface on the market in recent years, this timepiece is an absolutely exceptional specimen. Displaying completely original lines, curves, and finishes, it best demonstrates the genesis and factory specifications of the mythical reference. The bezel is overwhelmingly crisp and displays a bevel at the base that would have instantly disappeared with polishing. Of particular note is that sharp Rolex coronet and case number that is visible and immediately legible on the caseback, attesting to the untouched nature of this timepiece. Furthermore, a deep and sharp hallmark is visible on the bottom of the lug. As with all "Padellone" watches, the beauty lies in the dial. Those in original condition, such as this one, are few and far between and appear infrequently on the market. This particular example is best characterized as extraordinary. The dial is undeniably original. The sharp track where the moonphase aperture meets the rim of the subsidiary dial is incredibly precise and correct. One would expect to see significant spotting to the dial considering that this watch is not waterproof and has a snap on caseback. Yet, it remains clear of blemishes. Furthermore, the two-tone design is unmistakable and the "Officially Certified Chronometer" script is visible and crisp. If these details and attributes have not already surpassed any collector's wildest expectations, this timepiece is furthermore accompanied by its original numbered hang tag and presentation box, adding yet another layer of collectibility. Interestingly, while the present watch has a snap-on caseback, the hangtag says "Rolex Oyster", showing how the retailers used whatever supplies and accessories they had in stock, at the time. Even the Rolex strap is the original to the timepiece, which is a marvelous feat in itself. To acquire a reference 8171 is a dream for many collectors today. Yet, to discover one fresh to the auction market and preserved in unpolished condition with an immaculate dial, is positively unheard of. 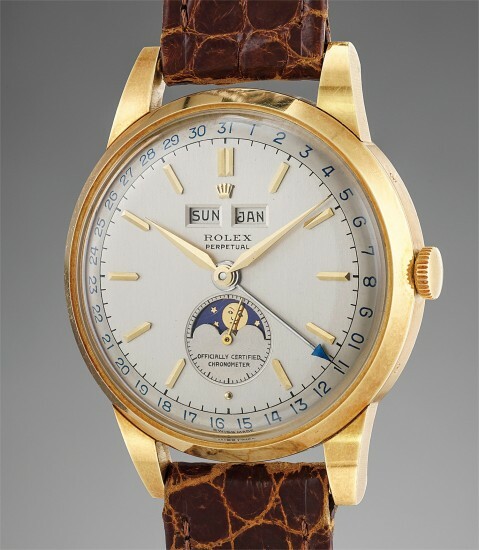 It is unimaginable when a white whale of watch collecting comes to the market, and it is with great certainty that another will not appear soon.